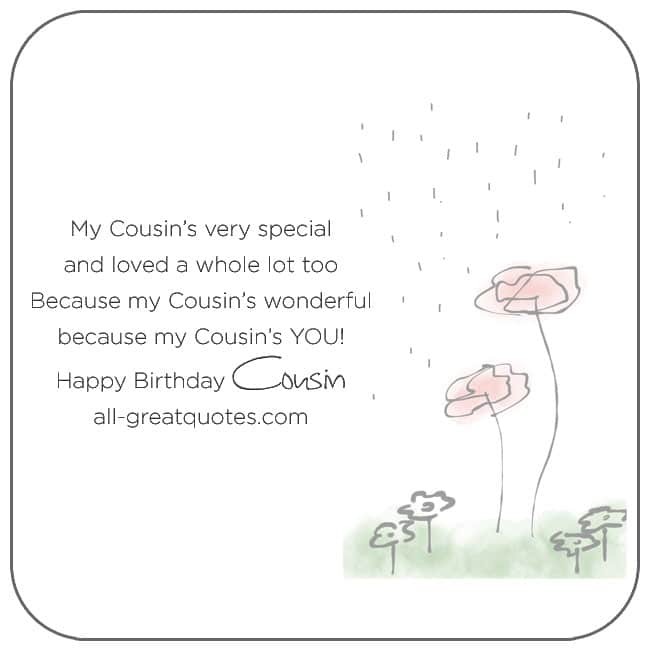 Collection of happy birthday Cousin Wishes Quotes and Cousin Poems for birthday cards. Post on Facebook email or send as a text. Make your Cousin birthday wishes are unique, by altering the words a little. I truly believe that nothing compares to the bond that I have with you, my dear Cousin. We share a connection that can never be broken. A relationship that will last forever. Growing up together and being there for one another along the way has had an amazing and positive impact. Our relationship is truly unbreakable. I love you, my dear Cousin. Happy Birthday. Happy Birthday, Cousin! Let’s celebrate the amazing life you have and the bright future that lies ahead. As I look back on my childhood and reminisce on the times spent with my Cousin, I can’t help but smile. You, my dear Cousin mean the world to me. Have a very happy birthday. As kids, we only got to see each other a few times a year, but we always managed to catch up where we left off. Have a wonderful birthday! We laugh together and cry together. At times we argue and at the same time we depend on each other for advice. Your problems are my problems, and my problems are yours. Your enemies are my enemies. Your friends are my friends. You make fun of me and I of you. We care for each other, we adore each other, and we will love each other until the end of time. Happy Birthday, Dearest Cousin. On Your Birthday With Love, Cousin. Here’s a wish for you for the brightest happiest, nicest kind of day. A greeting on your birthday to let you know that you’re thought of lovingly and to wish you the kind of happiness that someone as special as you truly deserves. Happy Birthday, Dear Cousin. My Cousin, My Friend. The world wouldn’t be complete without a Cousin like you by my side. Have A Fantastic Day. Happy Birthday, Cousin. Have a wonderful birthday and may each day of the year be touched with special happiness. and you are one in a million. Happy Birthday to my Friend and Cousin. 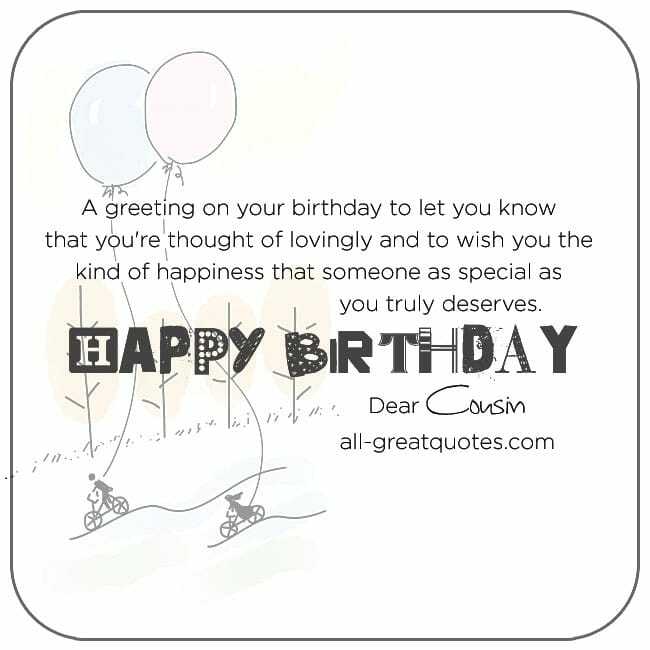 Happy Birthday Dear Cousin – May all the love you give to others come back to you on this special day. The great moments that we shared are among the best moments of my life. I‘m so happy to have such a special cousin! May your Birthday be perfect. Happy Birthday, Cousin. Have a Birthday that’s nicer than nice and better than best. To A Great Cousin Happy Birthday. Special people deserve a great Birthday. So I hope yours will be quite brilliant! 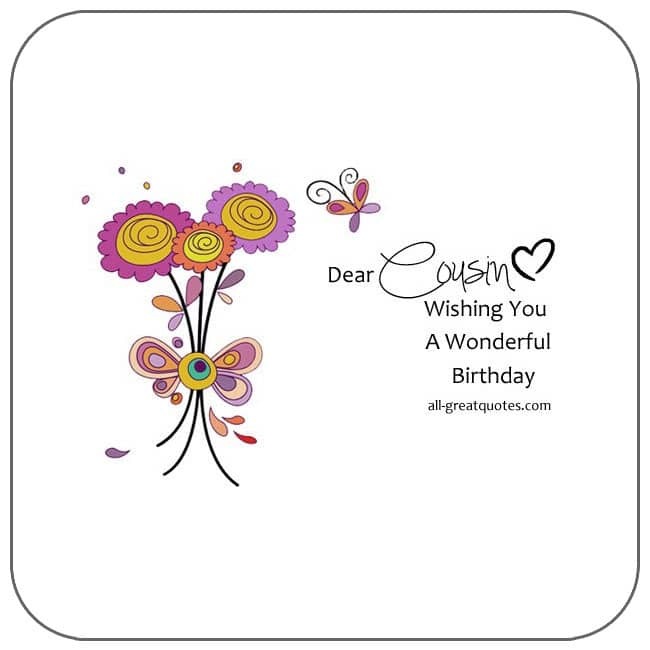 To A Very Special Cousin – Tucked in this card are lots of wishes of a wonderful day, just for You! Dearest Cousin – You’re always as close as the countless happy memories you are part of. With love Cousin on your Birthday. Dearest Cousin, it’s your Birthday! Time for celebrations and for offering warmest congratulations. Happy Birthday, Dear Cousin. May all the love you give to others come back to you on this special day. Quotes for Cousins Cousin Quotes and Sayings Cousins Quotes Best Cousin Quotes Quotes About Cousins I Love My Cousin Quotes Cousin Sayings About Cousins Cousin Messages. Cousins? Nah, we’re best friends. You will always be the sister of my soul, the friend of my heart. I smile because you’re my cousin. I laugh because there’s nothing you can do about it. Cousin Birthday Poems Birthday Poems For Cousin Happy Birthday Poems For Cousin Happy Birthday Cousin Poems. these words are brought to mind. is everything, you’re wishing for. you are a great Friend too! Cousin – Enjoy Your Day! the best of luck be near. I hope you’ll always know. for the nice things that you do! comes true, throughout this year. and happiness of every kind. good luck today and daily. and the best day of the year. and count my blessings every day. and each day through the year. these special words are meant. and you always will be too. a day you’ll always treasure. a day that’s just like you. filled with happiness for you. from those who love you most. from the moment it’s begun. comes true this following year. and may the future year.